The Wisconsin Hepatitis C Program is the lead agency in Wisconsin responsible for coordinating the state's public health activities related to the prevention, detection, and treatment of hepatitis C.
Important facts about hepatitis C…. Recent estimates of HCV infection in the US suggest 3.5 million people are living with HCV. The Centers for Disease Control and Prevention (CDC) estimates that 45-85% of HCV-infected persons have not been tested or identified. In Wisconsin more than 90,000 people are estimated to be living with hepatitis C, but only 42,500 have been identified. The baby boomer generation, people born from 1945-1965, is five times more likely than other adults to be chronically infected with hepatitis C. All adults in this age group should receive one-time testing for HCV, regardless of history of risk. In Wisconsin among people aged 15-29, the number of HCV infections has increased 400% since 2007. This increase is related to the opioid epidemic. 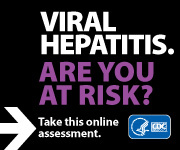 Testing is the only way to know if you have hepatitis C.
If you were born between 1945 and 1965, or if you think you are at risk, talk with your health care provider or local health department about testing for hepatitis C. Take the online assessment  to see if you are at risk for viral hepatitis. For information about viral hepatitis, visit the Centers for Disease Control and Prevention (CDC) website . A new cohort of young injection drug users acquiring HCV infection has been recognized in Wisconsin and nationwide, notably in suburban and rural areas. This article, published in the April 11, 2014 Morbidity and Mortality Week Report (MMWR), describes the use of rapid hepatitis C virus (HCV) testing as an important tool for conducting HCV screening, imparting prevention information, and initiating treatment in a population with high prevalence of HCV infection. Researchers from the Yale Schools of Medicine and Public Health found that the hepatitis C virus (HCV) can remain infectious for up to 6 weeks on surfaces at room temperature  resulting in a longer period for potential transmission of HCV than previously thought. More information read the HIV Blog . This new report provides baseline data for the health focus areas in Healthiest Wisconsin 2020 . It also provides information to document a range of health disparities found for some of the populations and communities in Wisconsin.